Gingivitis and periodontitis are serious issues that can be very harmful to the health of your teeth. Furthermore, there’s growing evidence to show that excess bacteria left untreated in the mouth can contribute to bigger health problems like diabetes and gum disease. There is hope, however – there are plenty of actions you can take to keep gum disease at bay and have a healthy smile for many years to come. 1. Visit the dentist regularly. Many times, especially in the early stages, the symptoms of gum disease are invisible to the untrained eye. Visiting your dentist on a regular basis for check-ups and cleanings is an essential part of stopping gum disease before it takes hold. Don’t assume that because everything looks and feels okay to you, that there are no problems. 2. Brush daily. Brushing twice a day with a fluoride toothpaste can help remove most of the plaque associated with gum disease, and this one simple habit is probably the most important when it comes to regular at-home care. Brushing is especially important in the morning, when bacteria have been building up in the mouth all night, and after meals, when it’s important to clear away food particles that get stuck on the teeth. 3. Floss daily. Most people are pretty good about remembering to brush, but remembering to floss is often another matter. Plaque between the teeth can be especially dangerous because it settles where your brush cannot reach. 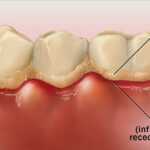 Over time, that plaque can cause inflammation of the gums that can lead to gum disease. Learning how to floss correctly and making the effort to do it daily is an important part of your oral hygiene habit. 4. Stop smoking, or don’t start. Smoking, aside from causing severe problems with the respiratory system, can also wreak havoc on your gums. In fact, smoking is one of the highest risk factors for gum disease, and in addition, being a smoker can reduce the effectiveness of gum disease treatments. If you think you may have gum disease, or if it’s just been awhile since you’ve been to the dentist and you need a check-up, you can book an appointment at our Fairfax, VA dental practice to have your teeth cleaned and checked out. Safe is definitely better than sorry, and the sooner you catch the early signs of gum disease, the more that can be done about it.